I did not know who else would be on the panel until arriving at the studio, when it turned out to be Zead Ramadan, board president of CAIR's New York office. 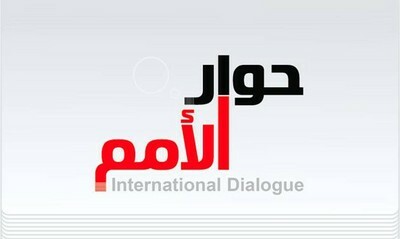 On American television, I would strictly refuse to appear with an employee of the Council on American-Islamic Relations or any other Islamist; but looser standards apply for Middle Eastern television, so I accepted a debate with him. Ramadan (back to the camera) and a technician adjust the wooden box to place under his chair. To my amusement, on entering the studio and seeing me, Ramadan muttered out aloud to no one in particular, "Ah, the devil himself." Even more amusingly, being far shorter than me, he demanded something to sit on and was brought a wooden box, which he sat atop and thereby managed to look as tall as me. Ramadan's wooden box did make him my height when sitting down. Only 6 percent of terrorism cases in the United States involve Muslims. (DOJ statistics show that, of all convictions tied to terrorism since 9/11 finds that Muslims with an Islamist agenda are defendants in 186 of the 228 cases, or 82 percent). If I did not know who my debate partner would be, Ramadan clearly did, for he plopped a piece of paper on the table in front of him full of negative quotes about me. During the course of the hour he referred to these quotes whenever he wanted to score a criticism. In particular, he repeatedly cited John Womack, a Marxist professor of Latin American studies (no less), about me. I replied by ridiculing Ramadan for coming on set with a sheaf of quotes about me when the topic was supposed to be U.S. attitudes toward Islam. 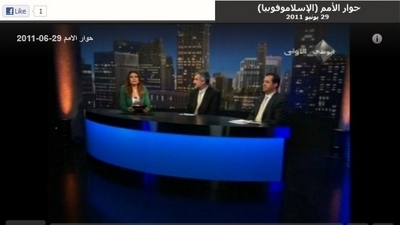 June 29, 2011 update: The show on "Islamophobia" showed today on Abu Dhabi Television. Sep. 11, 2013 update: Zead Ramadan ran for New York City council in District 7 and, despite some high-level endorsments (e.g., former mayor David Dinkins), he got only a measely 589 votes, or 4 percent of the total. Sep. 21, 2013 update: Ramadan spent $43,648.96 for 589 votes, which comes out to a princely $74.11 per vote. Had Barack Obama spent proportionately, his 65,915,796 votes would have cost nearly $5 billion, or 7 times the $738 million he actually spent.